67 w w w . M o d e r n T i r e D e a l e r . c o m T he brochure says it all: "BTS Tire & Wheel Distributors, your one stop for automo- tive equipment." And of course, tires. e wholesale division of Black's Tire Service recently held a dealer meeting at its headquarters in Whiteville, N.C., to reinforce the impor- tance of wholesale distribu- tion to its retail customers. Independent tire dealers from North Carolina, South Carolina and Virginia were represented. Organizers of the event were prophetic. They came up with the slogan, "On the Road of Change" well before the joint venture between Michelin North America Inc. and Sumitomo Corporation of Americas (SCOA), and then Goodyear Tire & Rubber Co. and Bridgestone Americas Inc. 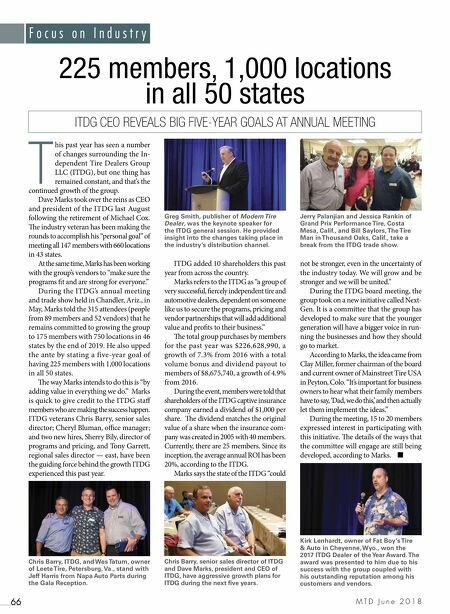 Speakers, including Modern Tire Dealer Editor Bob Ulrich, discussed the recent changes in the tire distribution landscape in detail. BTS inventories the fol- lowing brands: Americus, Goodyear, Federal, Vene- zia, Cooper, Roadmaster, Michelin, Kelly, Pirelli, West Lake, Uniroyal, Han- kook, BFGoodrich, Mickey Thomps on, C ont inent a l, Double Coin, Falken and Mas - tercra. Seven of the brands are backed by associate dealer programs: Falken (Fanatic), Goodyear (G3Xpress), Cooper (Medallion), Hankook (One), Mickey ompson, Americus and Federal. ■ On the Road of Change Bob Ulrich By F o c u s o n I n d u s t r y BTS KEEPS ITS RETAIL CUSTOMERS ON TOP OF THE TRENDS NASCAR Monster Energy Cup Series driver Timothy Peters signed autographs with the No. 92 BTS car on the premises. BTS stocks a variety of shop equipment and supplies at its four wholesale distribution centers in North Carolina. "I think that if everyone in this room stayed the same in their business and didn't change for the good, then we wouldn't be in business very long," said Frankie Pugh, general manager of distribution for Pugh's Tire & Service Centers, a six-store chain based in Greenville, N.C. 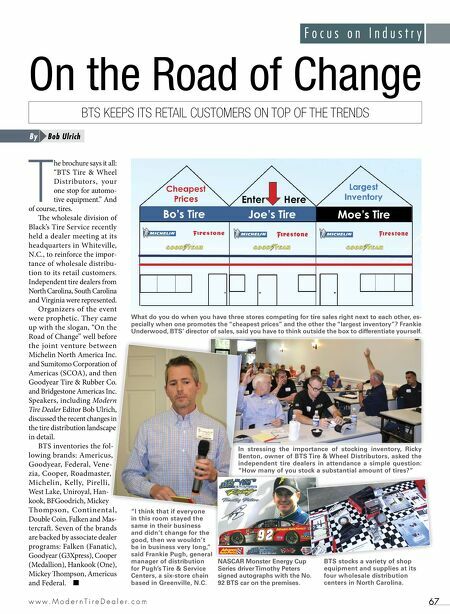 In stressing the importance of stocking inventory, Ricky Benton, owner of BTS Tire & Wheel Distributors, asked the independent tire dealers in attendance a simple question: "How many of you stock a substantial amount of tires?" What do you do when you have three stores competing for tire sales right next to each other, es- pecially when one promotes the "cheapest prices" and the other the "largest inventory"? Frankie Underwood, BTS' director of sales, said you have to think outside the box to differentiate yourself.